Bruno Camerin, company founder, has a lifetime of experience in the restoration of antique furniture and in manufacturing quality interiors. As a result of this knowledge and background the company is familiar with every historical style and period. 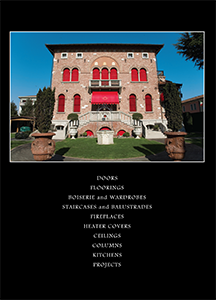 Our general catalogues show a wide range of ready made furniture with fixed measurements and construction but we also have a very unique speciality—the construction of custom furniture which can be designed by an architect, designer or even the client himself. The capacity to construct unique single pieces is rarely found in our mass-production world where manufacturers are not willing to spend time on individual requests. We have expert knowledge of every type of finish available-possible and impossible; leather, embossed leather (crocodile, ostrich etc), snakeskin, stingray leather (Galuchat) – always respecting the Washington convention for endangered species – plus mother of pearl and fine veneer inlays and also glass, mirror and crystal inserts, finishes in gold, silver, platinum, bone, horn, tortoiseshell and ivory, combinations of marble, wood, metal, cast bronze figures and carvings of every type and dimension. We are often asked to make the “impossible” and we always do with no exception. Once a request reaches our technical office we start studying it, making a 3D visual rendering to give the client the perfect look of the fully finished piece. We then make the shopdrawing for production and, once approved, we make the piece and safely deliver it to destination anywhere in the world. Our furniture has been sold in fine stores throughout Europe and Usa. Feel free to ask any questions you may have whilst browsing through our web site. Our sales department will be happy to assist and advise you. Presidential Palace in Astana: Engineering of all interiors for the THIRD floor: Residence of President of Kazakhstan. Presidential Palace in Grozny: Engineering of interiors of the 3 floors of the Palace: 6,000 sq. meters. Joinery of the private house of President Kadirov in Grozny, including all 85 doors. Engineering interiors for the 156 meters long motoryacht MAY, belonging to Ibraimovich, 2 floors, private apartments of the owner. 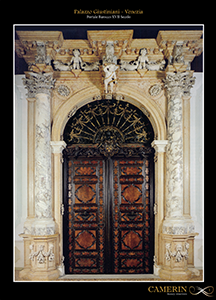 PRECISTENKA, 28: remake of the Liberty Entrance door of the Palace and internal hall (visible today in Moskow in front of Gallery Zeriteli). PRECISTENKA, 28: 1st floor large apartment belonging to Marina Cigalova, representative of Disney for Russia: all joinery and furnishings. Villa in Usinsk – Siberia: made for the President of Lukoil. KIKETI Villa in Tbilisi region, Georgia belonging to a Russian tycoon of Georgian origin. RUBLEVKA important mansion of 4,000 sq.meters by Nana Getashvili, leading interior Russian Designer: engineering of all doors and part of the joinery. Villa in New Jersey: complete joinery and doors. Residence in Singapore built by an Indian Tycoon: 3,500 sq. meters of Palace: special joinery interiors and furnishings. Russian Finance Ministry – Moscow: offices. Russian EMBASSY – Rome: Guest Apartment furnishes. Private home of Mr. Prighozin, owner of Concord – St. Petersburg, biggest Russian catering company. House in Belgorod, south of Moscow builded by Stella Karapetian. RUBLEVKA/Moscow: private house of Stella Karapetian: built-up of an astonishing library on 2 floors. VILLA SOLIS – Cannes (Russia Tycoon). VILLA CENTOROJ 2: GROZNY – President Family. VILLA CENTOROJ 1: GROZNY – President Wife Residence. VILLA AIMANI: GROZNY – President Mother’s Residence. RUSTAM VILLA IN BANJARMASIN – 4000 SqM of contemporary Luxury Villa. 83, DALVEY Rd – Singapore = 3000 SqM of Luxury mansion for an Indonesia Tycoon. RACKAM Villa – Doha – Qatar – All interior furniture. SHEIKA MARYAM Villa – Doha – Qatar – All interior furniture. MAJILIS Sheika Maryam – Doha – Qatar – All interior furniture. SOUK WAQIF Boutique Hotel – Doha – Qatar – 28 rooms in the center of Souk. LONG ISLAND – N.Y. : 1.500 Sq.m of Villa: all doors and joinery. BEIJING – CHINA – Residence Mr. Yun – Pharmaceutical Entrepreneur. SHERATON / DOHA – Selected areas including Monumental Horse Shoe Conference table and Royal Suites.